Shopping for Guardians of the Galaxy Wall Murals? 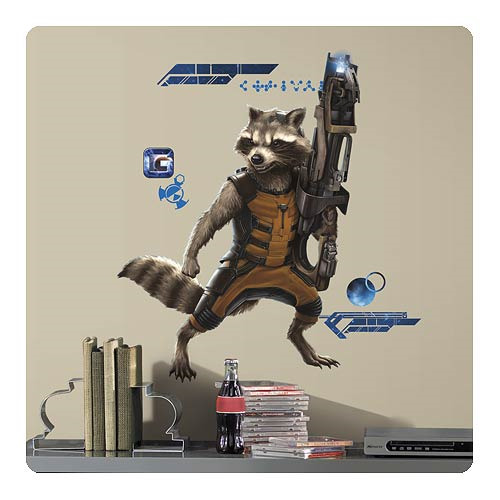 Bring your favorite Marvel Guardians of the Galaxy movie character Rocky Raccoon to your walls with RoomMates Guardians of the Galaxy Giant Wall Decals! Easy to remove and reposition, these wall decals are the perfect solution to adding life to a white wall! Backed with a peel and stick backing, these wall decals are the perfect solution to enhancing a room in minutes! Comes with a total of 15 decals and measures 35 3/4-inches tall x 26 1/2-inches wide when complete. Ages 8 and up!